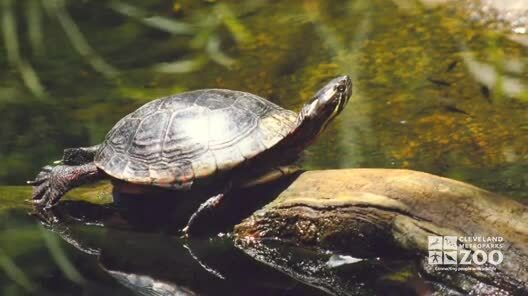 Adult Batagur turtles can reach a maximum length of about 23 inches. The shell is a uniform brown, smooth and heavy, with very little indication of scute boundaries. The head is small to moderately-sized with an upturned, pointed snout and a medially notched upper jaw. The head is olive gray on top, lighter gray on the sides and bottom, with light colored jaws. Both the upper and lower jaws have a denticulated (having very small teeth or serrations) middle ridge. The plastron is orange-yellow with smaller carapace opening. During the breeding season the male assumes a much brighter coloration, the nostrils becoming pale blue, but the rest of the head an intense black, changing to a rich crimson at the neck. This crimson color extends over the whole area of the front limbs. There are four claws on each front foot. All the toes are webbed with only 4 toes on the front feet. The skin is olive gray. Males have a longer, thicker tail and are somewhat smaller than the females. Batagur turtles range from Sumatra, Thailand, Burma and the Malay Peninsula. The habitat of the Batagur turtle includes tidal areas of the estuaries of large rivers, in brackish or even salt water. 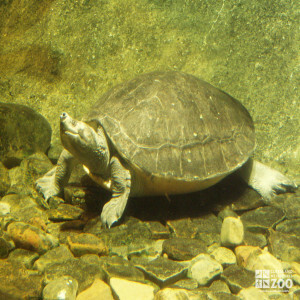 The Batagur turtle lives in large rivers, and nests colonially on sandbanks. Most feeding occurs at high tide, when vegetation is exposed and fruits from low-hanging branches become more accessible from the water. Nesting of batagur turtles takes place from early January to early March. A body pit is excavated, using both the fore and hind limbs, and a relatively long period (averaging 75 minutes) is spent in hiding the nest site. The eggs are brittle-shelled and elongated, about 3 inches in length. These eggs are frequently collected by the local human population, accounting for a decline in the batagur population. Under local law, one third of the eggs collected in Perak by licencees must be allowed to hatch, and the young reared until they are large enough to be safely released. However, the turtles are decreasing rapidly, possibly due to poor enforcement of the conservation regulations.